Happy Post Christmas Pre New Years! I hope everyone is enjoying the time in the interim. My brother from NYC is here celebrating the holiday with the rest of the holiday, and if things go as planned, we'll be eating lots and lots of food. I'll need to get my elastic pants out of the closet after this weekend! Do you have anything fun planned? 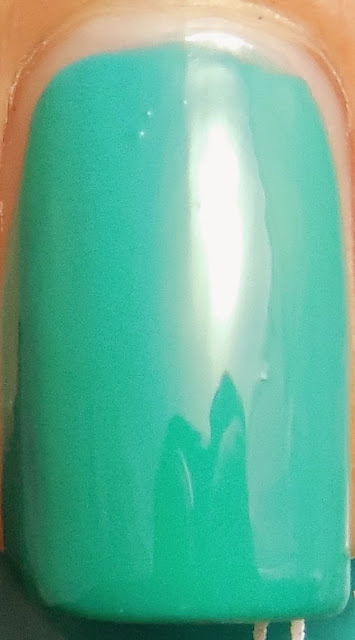 I haven't been staying current with the new Butter London colors but during a recent Friends and Family sale, one color caught my eye, and that was Slapper, described as a "truly teal nail lacquer, bold and very bright." Teal, check. Bold, check. Very bright, absolutely! And in case you were wondering, a Slapper in British slang is a woman with loose morals. Go figure out of all the newer colors I'd choose this color. Application was typical Butter London goodness, which was incredibly easy with its buttery smooth formula. 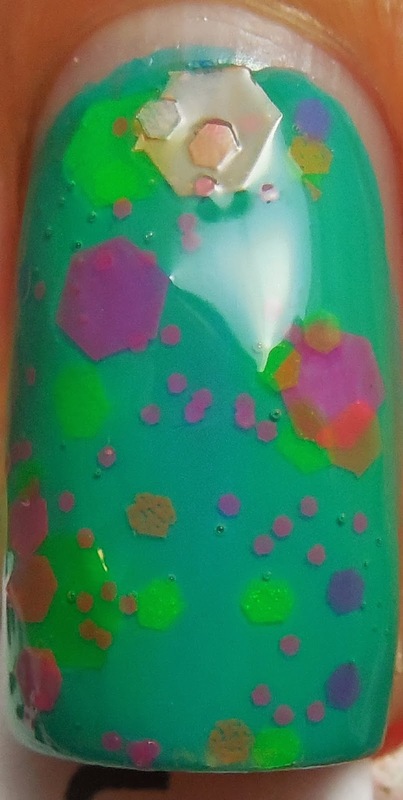 I used two coats here for opacity, and it dried to a pretty shine on its own. The only disappointment I could nit pick at would be that the color on the nail doesn't match what's in the bottle. 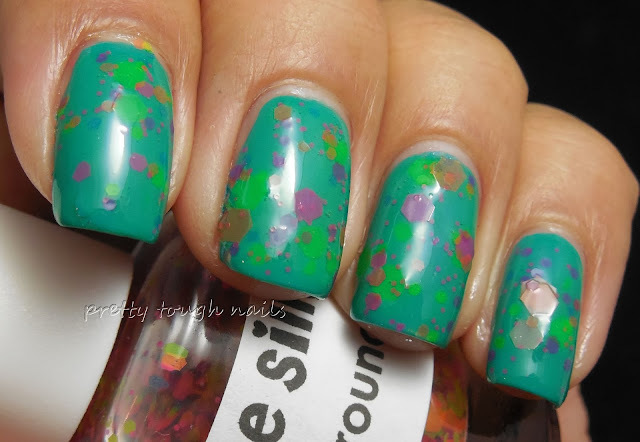 Once on the nail, it takes on a less bright teal effect and turns a bit greener.... I'm not entirely sure how that happens! *shakes fist at polish gods* No topcoat in these pics because I don't think it needed one. Next, I added a glitter topcoat that I lemmed ever since I first laid eyes on it on Instagram. I present to you in all its full glory, Polish Me Silly Clowning Around. It contains fabulous sheer neon hex glitters in varying colors and sizes. At the time of its release, which I think was during the spring, it was in a class to itself with nothing else rivaling its unique sheer neon glitters. Soon after there were a ton of me-too glitter variations that were released by other brands. I don't know why it took me so long to kill the lemming, but now that I did, I'm so very glad. I can see how versatile it will be over a multitude of colors, and it doesn't take someone a keen eye to be able to layer it successfully over another shade. Winning! The formula was thick as to be expected with a glitter topcoat, but it applied easily and had a hefty amount of glitter in each swipe. Some of the glitters were larger than I can usually handle(that's what she said) but with some careful placement I was able to control most of the runaway glitters. This is all finished with a layer of topcoat. Don't you love how Clowning Around transforms Slapper? It turns it into a colorful wonderland of glitters but without adding too much sparkle as to detract from a work environment. It's understated yet fun. *lovingly pets the nails* I would definitely recommend this polish, or one of the me-toos, to any self proclaimed polish afficionado. I don't know what's come over me after this post, it looks like this slapper just can't stop clowning around! Maybe it's all the pretty colors.... Have you tried Clowning Around? Did it make you want to start goofing off while wearing it? Don't forget to put your entry into the Hobby Polish Blogger's Holiday Giveaway, it ends December 31st! You get a chance to win a gift certificate for $100 or $200 once you enter. Click here to go to the original post! This is such a fun and cute mani! I only own one polish from Polish Me Silly and it's Birthday Cake, which I actually got from a blog sale. I'm already planning on using it for my birthday mani next year. I definitely want to buy others from their shop and I've always had my eye on this one.